SUMMARY: When plague wiped out the mainland U.S. years ago, only a lucky few escaped to the Outer Banks of North Carolina. Thomas, the only teen on Hatteras Island without the power of an Element, has always been an outsider. When the adult Guardians are kidnapped by pirates, Thomas and his friends flee to Roanoke Island, where skeletal buildings stand in tatters and mark the only evidence of a settlement that mysteriously disappeared. As the remaining teens and children make their stand against the pirates, they discover buried secrets that have dangerous ramifications on their futures. REVIEW: I had high expectations when I started this book. I have always been fascinated by the story of the Roanoke Colony. 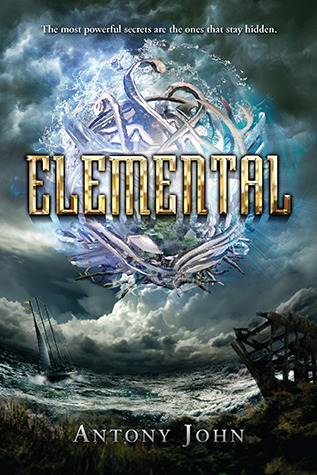 Elemental is the only fiction title I know of that features Roanoke Island and incorporates the disappearing colony into a new story. Add a deadly virus, scheming pirates, a love triangle, long-buried secrets, supernatural powers, and mortal danger into the mix, and I should have been hooked. I wasn't. I don't think this book is terrible; I just wasn't into it. The first few chapters were slow-going, and by the time the action finally picked up, I just didn't care much anymore. The love triangle is weak, and I didn't really care which girl Thomas ended up with. He fluctuated so much between them, I really doubt he really knew who to choose, either. The love triangle won't matter to everyone, but for me, a good romance can salvage a dull story enough to keep me reading. It isn't enough in this book. Did I hate it? Not exactly. While it wasn't my thing, I know there are plenty of readers who are far more patient than I am who would probably love Elemental. Author Antony John chose his Roanoke Island setting wisely; the setting alone will draw readers. If they can get past the first 100 or so pages, readers will enjoy plenty of action and mystery. THE BOTTOM LINE: Not for me, but I think lots of people will enjoy it. STATUS IN MY LIBRARY: I plan to order it. There is definitely an audience for it at my school.